This game is obviously more recent than my last game I reviewed, but know that I only review games I recently played. Perhaps many of you have heard of this one? I hear it's a dousy! I was not hesitant to enter the world of Half-Life 2. I mean, having beaten the original and both its expansion packs (and loved them to boot), I was obviously eager to play the much hyped-up sequel... but then again, I was still playing the original Half-Life online (! ), so maybe I was jumping in too early? Nevertheless, HL2 (after a good session of play) gave me everything I expected from the name: Cool guns, smooth controls, mutants, dry storyline... wait a minute! Yes, HL1 was not the insanely awesome single-player that many hype it up to be. Almost devoid of a story, it was a fun time, but I was often questioning why I need to ride mine-carts for hours on end. Sadly, HL2 falls to many of HL1's same flaws. The game makes you think something awesome is a brewing at the beginning... but pretty much nothing significant happens for literally the rest of the game. The humans and enemies both come in large numbers, but no one is really that memorable. Still, it's not like HL2 doesn't improve on things: gameplay, graphics, and environments all come with noticeable changes and improvements (more on that later though). The pistol is a pretty useful when you...aw, forget it; the pistol blows! The sci-fi levels at the end of the game are possibly the games' finest (and are almost Halo esque). Possibly the deepest FPS ever! Bottom Line: For everything I can find fault with HL2, somehow, even with its faults in play, I can still have a damn fun time with the game. 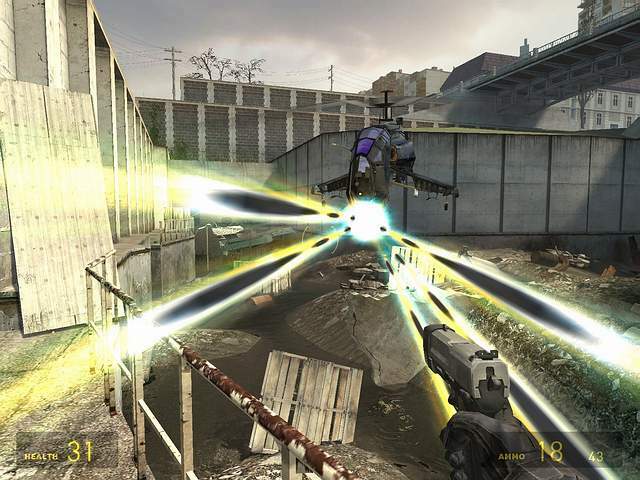 Yes, the game is overrated, but as a shooter, it gets the last ticket to first class, and, as a PC type of shooter, it is still the best FPS series on the platform, even without the multiplayer!